Three years ago I was looking for a horse. I have ridden since I was six and was approaching 60. I only had ever had one pony, moving on to horses in my early teens. Over the years I had done many things with horses but the horse I had just retired was a 16.2 TB/Clydesdale who I had bought at six months and retired at 21 having mostly competed in dressage. I had thoroughly enjoyed training her and riding her but I was ready for a change. 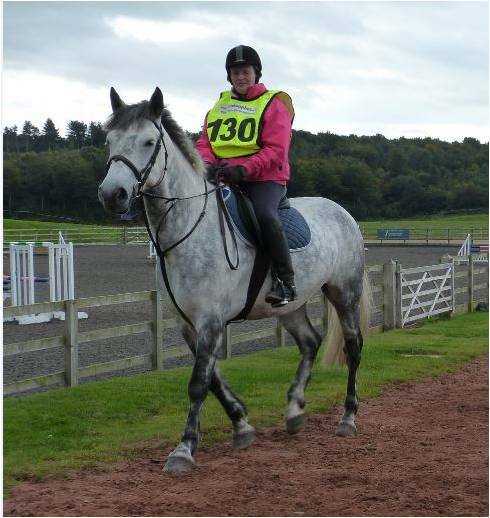 I had long since decided that my next horse would be smaller and that I wanted an all rounder to have fun on. Competing was no longer so important to me, especially as I am busy helping my daughter with her horses and I enjoy doing that. I decided a Connemara would fit the bill and started to look. I was lucky to find a 15.1hh 7 year old who had been loved and enjoyed but totally outgrown. He had been ridden regularly but not had many outings. The one stipulation was that he must be jumped as he loved it. I said that I would jump him for fun but my daughter would do some competing on him too. I set about getting to know Tomas and he quickly showed me that he was everything I could have hoped for. A super hack, lovely jumper and polite and trainable on the flat. I should probably say at this point that I have taught Mrs Pat Guerin for many years and she is a great friend. We also work together on the committee of Border Bridleways Association of which I am Chairman and Pat is Social Secretary. Many of you will know that Pat is a devoted member of EGB, having competed successfully since the 1970s. Gradually Pat began to mention possible pleasure rides I might enjoy and then maybe I would like to join the Riding Club endurance team? Of course, she got me hooked! It was a bit odd - I have been so used to giving out information on Riding Club, Pony Club, BS, BD and BE and suddenly I was involved in something about which I didn't have a clue! I am never going to be an all out competitive rider, I compete for fun when I can fit it in with my daughter's arrangements - there is only one lorry! I have, however, this year done seven novice GERs of between 32 and 42k with six grade ones and a grade 2. I was persuaded to do the inter-regionals at Cranwich and had a lovely weekend, made new friends and helped the team to second place. To top it all our East Cheshire Combined Training Group endurance team won the BRC Championship at the Lion's Tail ride. The team consisted of three good friends of many years - Jean Spearing, Jane Wyatt, myself and......Pat Guerin. The 'galloping grannies' is our sub title! In addition to this I have enjoyed numerous lovely social rides in glorious country with excellent company. Tomas came second in the Connemara Achievement awards for endurance and fourth for show jumping. I have to mention that two weeks before being on the winning BRC endurance team, Tomas had come individually 3rd at the BRC Novice Show Jumping championships at Lincoln, thereby ensuring another team win for ECCTG, this time with my daughter, Nicki. She has also borrowed him to event successfully. We are enjoying him so much that we have bought a three year old Connemara to school and eventually pass on to a good home, where hopefully he will give as much pleasure as Tomas. I look forward to next year, trying some different rides, meeting some new people along the way. Tomas and I would like to say a big thank you to all the committee members and volunteers who make up the sport of endurance.